When I first picked up World of Warcraft in 2005, I had a grandiose idea of how it would be; the concept of an MMORPG was always appealing to me because of everyone playing in the same world, and I expected it to be vibrant, active, and thriving. I’ve always been disappointed in the cities in WoW. A lot of them feel dead, especially once you got away from the practically useful ones that have banks, flight paths and auction houses. Perhaps what I like the least, though, is how certain cities (Horde was worse for this than Alliance) don’t feel livable. They don’t seem big enough nor have enough room for the “regular people” of the Warcraft universe to live in, and it leaves them feeling small by comparison. When I picked up World of Warcraft: Legion on launch day I expected much of the same. Despite Dalaran returning as a central hub, most of the towns in the Broken Isles are similar in that they consist of a building or two (one of which can serve as an inn) and a bunch of NPCs standing around. In the worst cases, some are literally just a flight path in the middle of nowhere — however, the thing is, the Broken Isles are supposed to be just that: broken. Hitting the max level (110) opened up Suramar, which is supposed to be one of the endgame zones of the expansion. 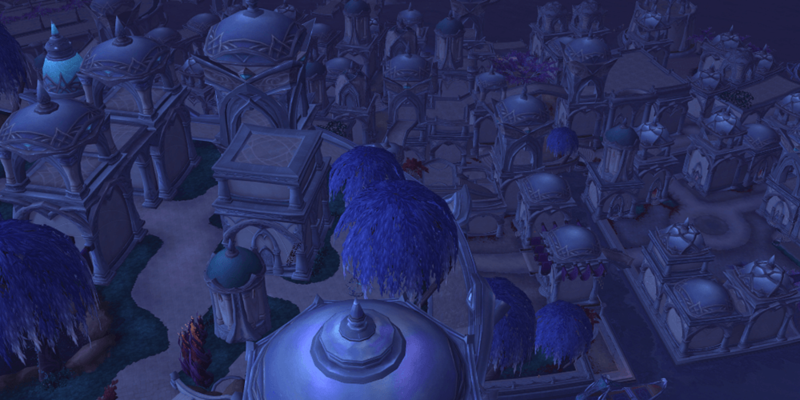 Within it lies Suramar City, which is important to the series’ story. Over my time spent in the city and doing daily quests to improve my reputation with its factions, I’ve found that it’s probably the closest think to a functioning, alive community in World of Warcraft. 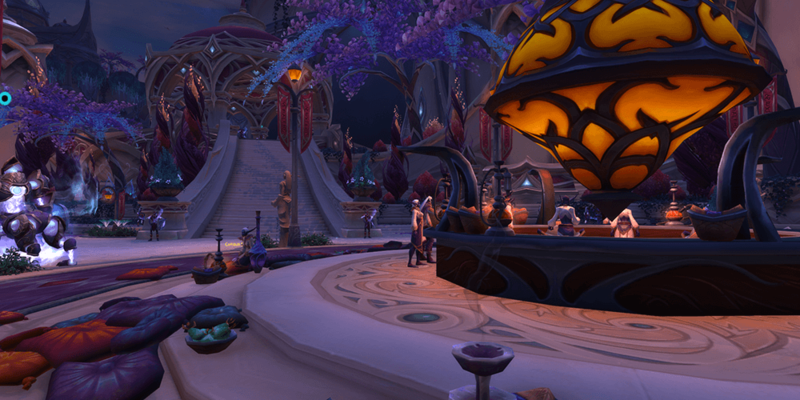 Suramar is important, both as a zone and city, as several key Warcraft characters lived there thousands of years ago. The city itself managed to shield itself from the Sundering of Azeroth (a large, earth-shattering event) with a magic shield bubble; the rest of the zone lies in ruins. The inhabitants of the city assumed the rest of the world was lost in the event and were content to keep living with the magic of the Nightwell to sustain them. 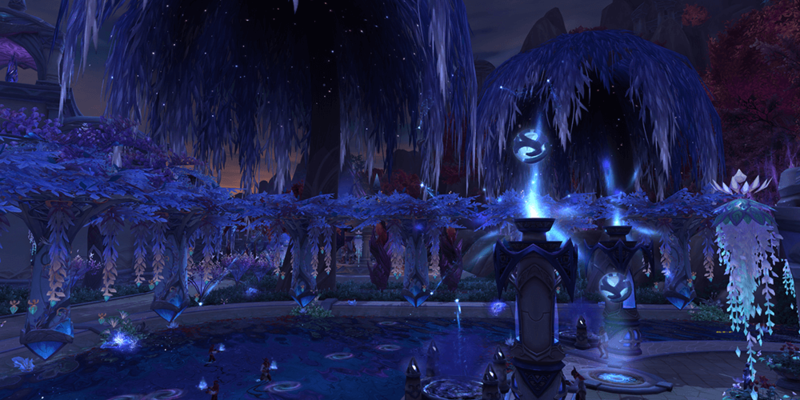 Over time, the inhabitants of Suramar City became addicted to the Nightwell’s magic for sustenance, and politics became essential to making sure that different classes of citizens could get their fix. The Ancient Mana, distilled into drinks like Arcwine or given in crystals, allowed the Nightborne to avoid becoming Nightfallen: warped, withered individuals who put themselves in danger of becoming mana-addicted, feral husks. When the player enters the zone, they are given some of the usual quests that involve killing things, rescuing others, and meeting the indigenous factions. Eventually, though, you venture into Suramar City; there are hostile guards everywhere, and that makes travelling through it difficult. After some time, you learn about how the higher class of elves (headed by Magistrix Elisande) use the rationing and withholding of Arcwine to control the lower classes; you learn about how the lower classes are eager to resist and push back against that ruling class. Elisande also is in league with the Burning Legion, the adversaries in the expansion and ultimately the whole series of Warcraft. This sets the stage for a great storyline involving multiple characters and events. Partnering with Arcanist Thalyssra, a Nightfallen with a grudge against Elisande and the ruling class, you eventually unite other sympathetic parties within the city walls. One of them gives you an enchantment that can only be used within Suramar City walls: the ability to give yourself a magical disguise to blend in with the Nightborne elves. This allows you to move freely among the citizens and guards, but you can be revealed by units with a glowing circle (showing they can “see” through your disguise) above their heads. It’s after you get this disguise where the real genius of the city’s design falls into place. My giant cow person, disguised as an elf. World of Warcraft is a pretty simplistic game at its core: get an enemy’s attention, kill them before they kill you, and avoid taking on more than you can handle. Within Suramar, however, the game forces you to backpedal a bit because of the opposition you face. Despite a massive amount of equipment and magic, the player risks getting overwhelmed by sheer numbers if they choose to toss off their disguise while wandering around the city. This forces you to be a bit more sneaky: while cloaked as a Nightborne, you can talk to vendors, friendly NPCs, and even walk right by guards without having to worry. You start planning out your route to best avoid detection and high-level enemies, learning how the streets work. Eventually, you grapple to the top of buildings and discover secrets there, too. Basically, there’s a lot of ground to cover, and ways to re-establish your disguise if broken (like diving into a “Conveniently Placed Basket” to hide). As a long-time WoW player, this struck me as a pretty cool because running missions while having to keep up the long-term duplicity was something new. There were quest NPCs that you took jobs from that would never know of your alter-ego; you end up manipulating a number of different people, even if your goals align. You get sucked into a grand conspiracy to oppose those in power from the shadows, and it’s done in a much more subtle fashion that just grabbing a group and slaughtering everything in your way. 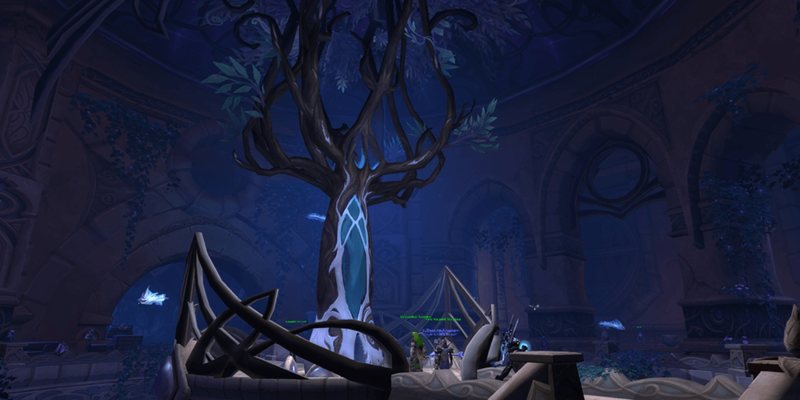 In doing quests, I felt like I was getting a better idea of how Suramar functioned as a society rather than it being another dungeon to run through. I was angry when an NPC who taught me how to produce my own Arcwine was killed in front of me. I felt for the NPC child who was abducted from her family as political leverage; it was cathartic to break into a guard’s house in order to exact revenge. I felt like I was making progress when I managed to establish a safe haven in a district of the city, and wary when I ventured out of it. Eventually, you start smuggling sympathizers out of the city to the ruins your faction is holed up in, which grows as you complete more of the story (pictured above). You start producing your own Ancient Mana, and start helping addicts by pulling a Robin Hood to disrupt the dependence. 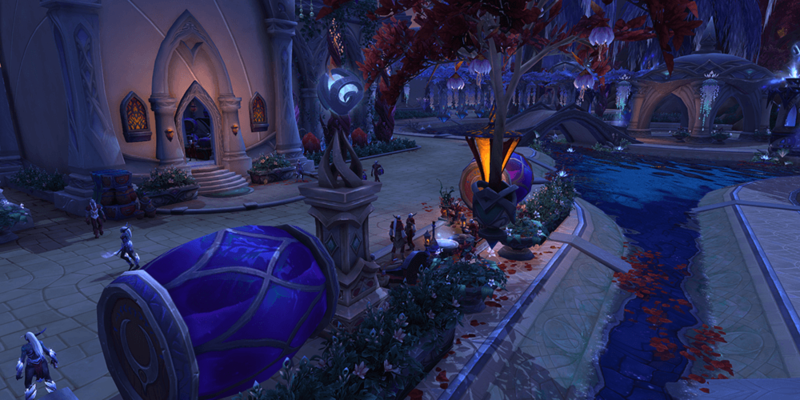 More people move into your hideout, more amenities (like mailboxes and portals) open up, and you can feel the change from when you and Thalyssra first found it, empty and abandoned. All in all, it felt very Assassin’s Creed in that a lot of the plot gets its drama from working with an underground resistance up until a point where striking out in the open becomes viable. By undermining the various bits of how the elites function, you feel like you’re actually doing something to help; however, there’s always the nagging question of how the rest of the populace will be brought around to your cause. Because of the disguise, and the majority of the action in the zone taking place in the city, it’s allowed to have a massive amount of NPCs present, regardless of whether they have a function or not. Seeing messengers running through the streets, gondolas transporting people, or even a functioning marketplace or zoo means that it seems that people and players do more here than just fight, heal, sell items and move on. You can just as easily spend an afternoon fishing off the edge of a dock in your disguise and it feels like the city functions around you; you can go explore houses and actually find items you need to win more reputation. It all seems livable and practical: it feels like more work was put in to avoid it feeling like it’s just a theme park for quests to occur in. This is a stark contrast to the general wilderness and chaos of the rest of the expansion’s setting, and I think it’s a welcome change. 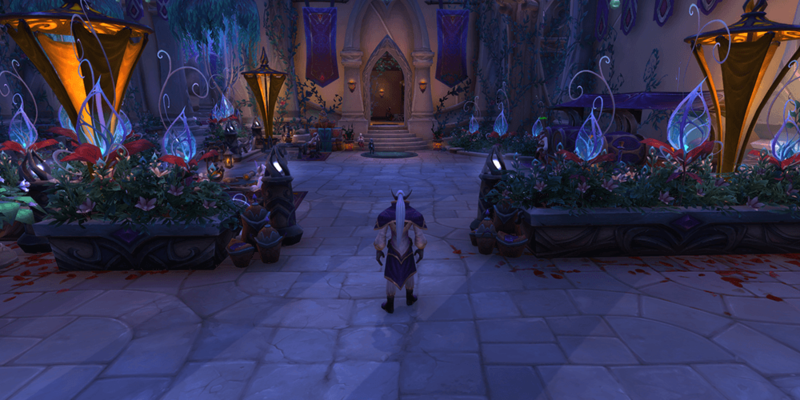 Sometimes you need to have that dose of civilization, but present a challenge in a different way: the change in Suramar City is one you get over a long period of time, not one that’s solved all at once. Matt Demers writes about video games. You can follow him on Twitter.